I captured a relatively high resolution image of the eclipse that presents at 0.46”/px. Imaged with a Canon 5dM2 camera for color and a QHY183C for luminance, both with an 8” EdgeHD. Capture resolution was 0.23”/px. but I down sampled to 50% to keep everything sharp. The first image is highly reduced, but I’ll follow with some cropped areas. May I ask what were your exposure times for these and whether you where shooting at f/10? Also, you changed cameras in the middle of totality to switch from the DSLR to the QHY183C? That image scale (0.23 arc seconds per pixel) is close to the native f/10 for an 8" EdgeHD with the QHY183C but that camera doesn't come anywhere close to covering the entire moon at that focal length. So, the image scale and that camera suggest that you'd need to do at least a 2 x 2 matrix to cover the entire moon. I don't know, maybe you got the image scales mixed up or used some other scope or configuration for the images taken with the QHY183C. Or, maybe you did do a matrix? In any case, it's very sharp. Both were imaged at F/10. I believe the image scale with the 5dM2 is 0.61"/px. Exposures were 1/2" at ISO 3200. 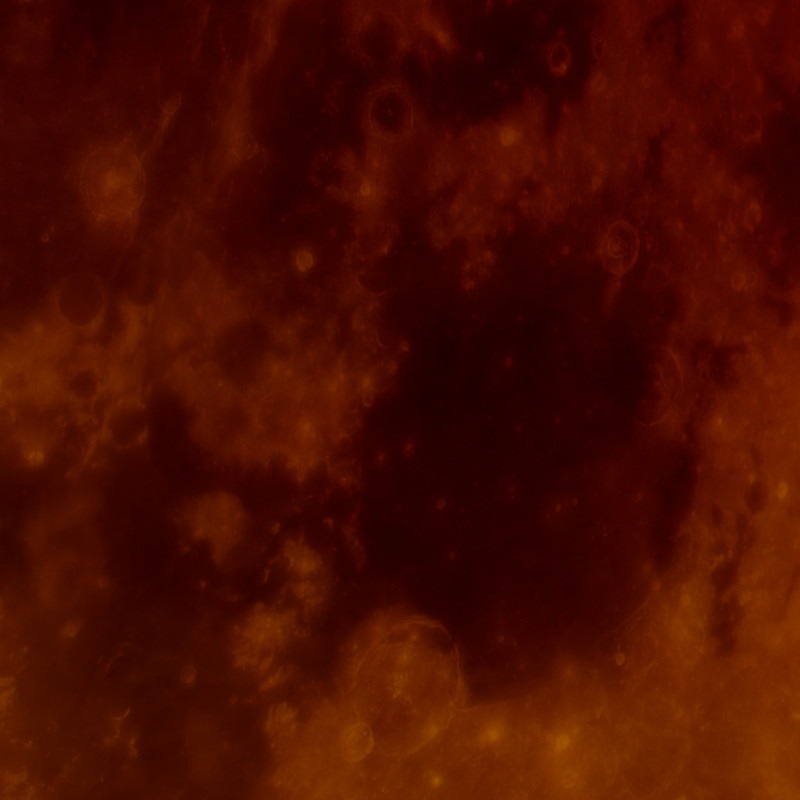 I upscaled the image to be overlaid with the QHY183C data. The QHY183C had 7 panels. 8 bit SER files of 2500 each. 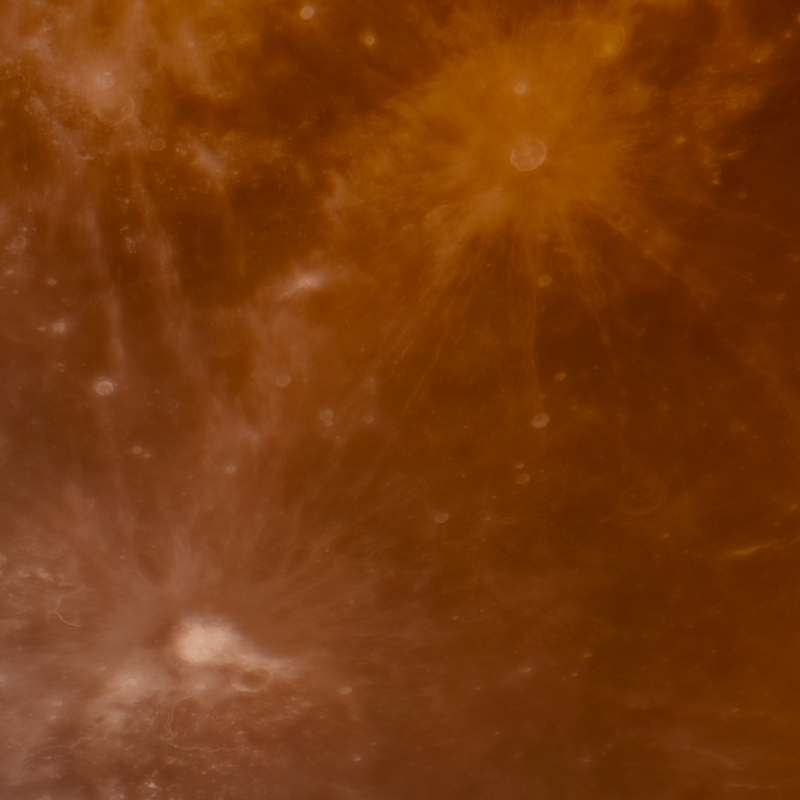 Seeing was actually quite poor during this portion of the imaging as the winds were buffeting my telescope at ground level, a 90+mph Jetstream above, and the moon was quite turbulent. I used the best 500 frames from each panel and was quite surprised I got the quality I did. QHY183C data captured after totality. After quite a bit of effort to overlay the images, I downsized the image by 50%. Edited by aeroman4907, 23 January 2019 - 11:22 AM. Your rendition is exquisite. I think you nailed the blue ("ozone blue" as I guess they are calling it these days) edge color...not extreme, looks pretty darn close to what I saw visually. I'm quite intrigued by how you combined post-eclipse high resolution data with the colored totality data. 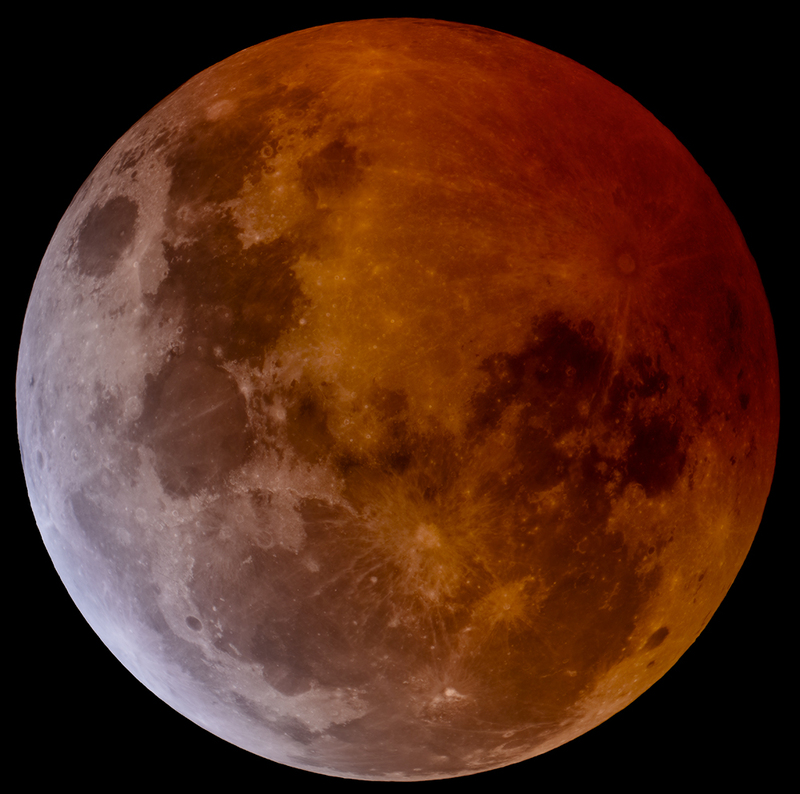 Your results appear to be excellent, and the detail is amazing (I think this is the most detail I've ever seen in a total lunar eclipse, and I've put a lot of effort myself into bringing out as much detail as I can over the last five years over numerous eclipses). I'm wishing now that I'd slapped the ASI183MM Pro on the scope after the eclipse had ended and done the same thing! This looks very nice. When I first saw this, I was curious as to how it was possible to capture 8x2500 frame panels during a total eclipse with long exposures, so I immediately assumed that you imaged the Moon either before or after the eclipse. When you say the luminance data came "after totality", I assume you mean after all the partial phases as well, as you would need to have a normal Full Moon without any of Earth's shadow, correct? If so, then I'm interested to know how you overlaid the color data on the luminance data, because as I'm sure you are aware, when imaging the Moon at high resolution, even a short period of time in between images makes it difficult, if not impossible, to perfectly overlay them. Even in a 20-30 minute period, there is enough libration change in the Moon to introduce a noticeable "wobble" that makes the two images non-identical, and no combination of translation or rotation will correct for this. I assume this still worked out for you because the RGB data doesn't need to have the same resolution as the luminance data to colorize the image. So "close" is good enough. The final result does appear to have turned out nicely! Thanks for the compliments Jon and Tom. Tom, you are indeed correct, I imaged just about immediately after the last partial phase when the moon was higher in the sky. I didn't know for sure if it would work because of libration, but I figured it was worth a shot. Its an interesting tale, but I answer the technical first. 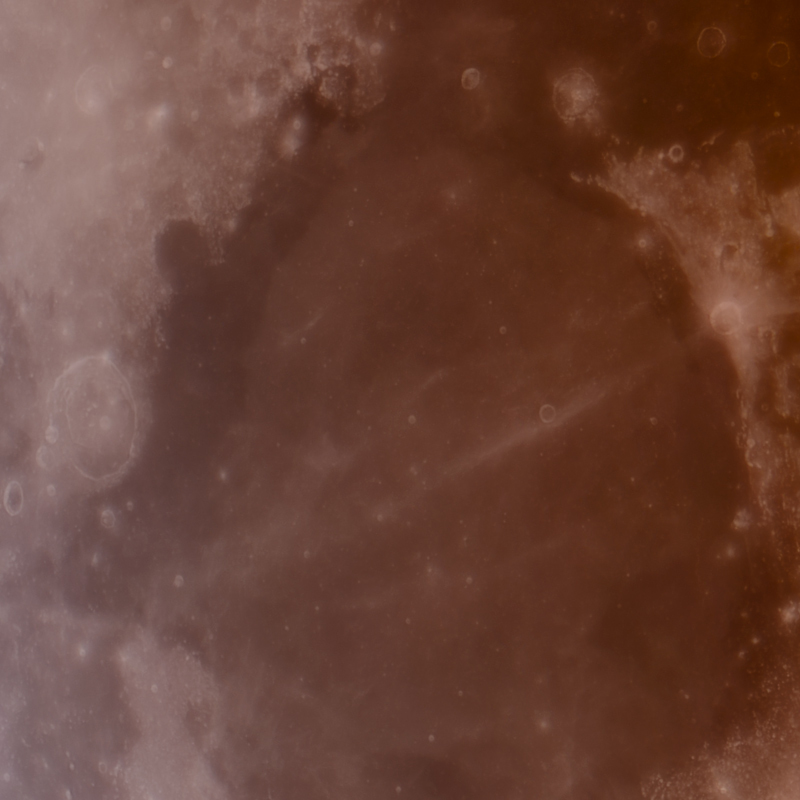 I recently figured out with other color processing of the moon images I don't need the color data to be at the same resolution as the luminance data. Truth be told I already knew that from processing some forms of other astrophotography, but I was using full resolution color data because my camera records in full color and thought it important because of the sharp features on the moon. I've since learned I can address some color artifacts by moderately decreasing the resolution of the color data. As such, I figured I would capture decent color data with the 5dM2, and then carefully upsample to the resolution of the 183C. That being said, I kept the color detail fairly resolute, so it did require the luminance data to be properly overlapped within 2 or 3 pixels of the upscaled color data. Getting a pretty good match of the luminance data over the color data to that level was very, very difficult. It took two attempts and about 6 hours of work to figure out a process and get the images lined up pretty closely. I used various techniques in PS to accomplish this. After that was done, I had to figure out how to blend in the higher resolution detail without significantly altering the color or tonal values of the RGB data. That was another 6 hours (spend early this morning when I couldn't sleep as I was thinking about it). I wish I took notes about how I did everything, but I just was plowing through, and there were a large number of steps involved. As such, I am not trying to be purposefully cryptic, but I can't readily recall each step. Even if I did, it would take a really long time to explain and would require a booklet because it has masking involved as well that would be specific to the particular capture settings unique to each image. That being said, the real key was to use the 'soft light' blend mode for the luminance data over the color data. There is a lot of tweaking and masking that needs to be done with this trick though as the contrast is too high with the straight blend and doesn't provide a natural look. Simply reducing the opacity of the blend doesn't work well either. Regarding my interesting tale during capture, I thought I had adequately charged my portable Celestron battery pack, but that was not the case. Towards the end of the totality phase, my mount made this funny sound I never heard and stopped tracking shortly thereafter. I realized that the battery had run out. I'm glad this happened after I was taking the longer exposures for totality. The battery doesn't accurately tell you when it is charged, and I've read you can damage the battery by over-charging. And of course it can't charge and power the AVX mount at the same time. Knowing I wanted to try and image with the 183C immediately after the last phase of the eclipse, I plugged the battery in to recharge. I also know that the battery charges slowly, so the bit over an hour or hour and fifteen minutes wouldn't buy me much time to image after that. I was able to take some images un-tracked at the latter part of the eclipse by keeping the exposure time to 1/100" or less. Once the eclipse ended, I powered up my mount with the last calibration and put my scope on a star as fast as I could. Seeing was never good, but had definitely gotten worse as I started imaging with the 183C, with the winds buffeting my mount pretty strongly and the Jetstream was also causing the stars to twinkle heavily. At this point I am figuring the 183C isn't going to give me any better useful resolution than the 5dm2, but I figured I could still benefit from a blend with less noise to deal with. I also know I was going to be super lucky to collimate, focus, and then capture 6 or 7 videos before my battery ran out again. I slewed quickly to a star somewhat close to the moon. I don't know which one, just something in my finder that looked bright enough and not too far from the moon. My thinking at this point is that seeing is so bad and time was so limited that only a rough collimation and quick focus is warranted and I would have to significantly downrez the file to that of the 5dM2. I only did pretty far out of focus collimation within a couple minutes time. Oddly enough, the PP was fairly centered, and a lucky quick tweak of a screw seemed to put it very close to center. I did try and do a tighter focus, but I would quickly estimate the Pickering at a 1 or 2 so I didn't bother with further collimation. Again, I figure seeing is pretty bad, so a horse shoes and hand grenades collimation would be okay (but not ideal). As a funny side note, normally my collimation is way off between each imaging session (generally a couple of months apart due to seeing), and despite being careful in how I carry and store the scope, you would have thought I dropped it off of a truck each time. I've been bungling through collimation lately and need to follow procedures like you have recommended Tom, as well as Darryl recently. Normally it takes me 20 to 30 minutes to collimate. Anyway, I then slew to the moon and attempt a 'quick' focus in a couple of minutes. The moon is wavering badly and I again just go for the horse shoes and hand grenades approach, especially with the only contrast at the perimeter of the moon and somewhat bright crater (I don't even know which one). I took 7 videos because I had to hastily compose each frame and wanted to have adequate overlap. I was going to take a safety frame, but my battery ran out within seconds of slewing from my last critical video. A real blessing from God that the battery lasted exactly as long as I needed it. To prove even more a miracle, the data wasn't nearly as bad as I thought. I must have hit near perfect collimation and focus, even though I rushed through it in horrible seeing - again, a real miracle. The quality graphs through AS!3 were all over the place and generally indicative of exceedingly poor seeing. I took the best 500 of 2500 frames for each panel and ran with it. I used very careful techniques for deconvolution and processing, but I was surprised I got the useful resolution I did. Almost every imaging session I've done - about a dozen or so now, I've had some form of newbie technical hiccup. While I am still working on my processing skills, they FAR exceed my capture skills. Its typically both a rushed and lengthy process and never relaxing for me to image and is total amateur hour each time. I can only hope I finally get better at it and heaven forbit, actually enjoy the process. Sorry for the rambling discussion and poor grammer but I tried to quickly type this. I'm done boring you with my tale. Looking forward to seeing more of both your images. aeroman4907, thanks for the thorough description of your technique. Like Tom (above) I suspected that your image might be some kind of hybrid, since the eclipsed moon usually has a somewhat "soft" and pearl-like appearance. A bit like the difference between taking a picture in direct sunlight versus waiting until dusk when everything is illuminated by diffused light from the entire sky. In any case, it sounds like you put in a lot of work to make this rendition and it certainly produced a sharp result. Sure thing James. I of course have the traditional image as well, but wanted to have a version I could print more enlarged with some extra detail. It actually took quite a bit of effort to keep it as 'soft' as it is now, i.e. lower contrast.